Last week, I was attempting to go to Inglewood to check out some more historic aspects of the city. Well, as usual, I get lost and stumble upon this gem; a self-guided art walk at the stampede where the Calgary Stampede takes place. It was quite interesting. Bronc Twister: This statue is based on a drawing from a Californian artist, who happens to be well-known, that goes by the name of Edward Borein, which was the inspiration of the 1919 “Victoria Day” Stampede celebrating the end of WWI. It was presented to the Calgary Stampede on the occasion of the 75th Anniversary of the Province of Alberta. Early Cowboy Chuckwagon Race: This mural depicts the first chuckwagon races in 1923 and was commissioned in honour of the 75th Anniversary of the GMC Ranchland Derby. Round-up: The bronze sculpture, appropriately titled, “Roundup” depicts the western heritage that makes this part of Canada truly unique and illustrates the importance of the agriculture and ranching industries in Calgary and Southern Alberta. By the Banks of the Bow: As one of the largest pieces of art in North America, fifteen horses and two cowboys, blend historical and modern day images into a larger-than-life story that reflects the spirit of Calgary – from the influence of the Bow River to the significant role of the cowboy and the free-spirit of western horse. Courage and Thunder: The sculpture’s low and high relief work captures the essence the chuckwaggon teams stampeding and pounding together in close competition. The sculptures approach is minimalistic using negative space to probe both imagination and intellect of the viewer. The Ride: A relief capturing the power of the event and the precarious of both bull and rider in full dimension, together with the bull’s portrait, are linked by a minimalist line, showing the rider’s risk. 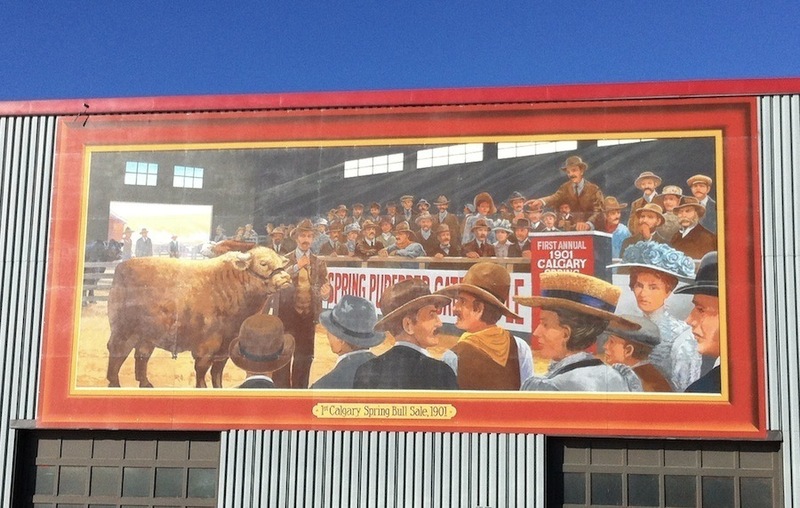 Guy Weadick – The Dream (top): This mural depicts Guy Weadick’s hopes for the Greatest Outdoor Show on Earth. Early Stampede Parade (bottom): This mural takes you back to the 1912 and 1919 Stampede Parades showing teams of buffalo, mounted bands and parade marshal Fire Chief Cappy Smart. Agriculture Exhibits – 1800s: Calgary hosted its first exhibition in 1886. It included seven classes for grain as well as vegetable and flower exhibits. The agriculture community has gathered annually in Victoria Park since those early days to show the finely livestock, seed, and hay samples. Cyclone into the Sunset: This mural depicts the 1912 Stampede Rodeo ending under the lights of cars which surrounded the Infield. Tom Three Person, a Blood Indian, rode the outlaw horse, Cyclone, to a standstill becoming the first saddle bronc champion in Calgary. 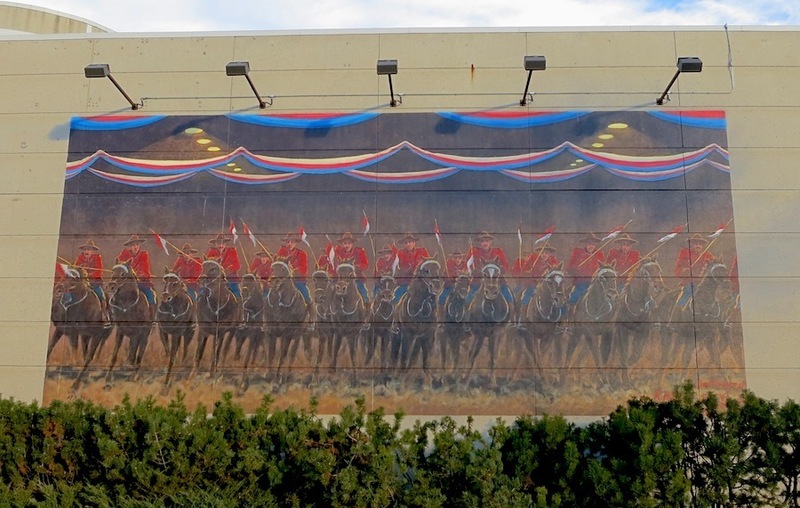 Ceremonial Ride: This mural depicts the mounted ride in the Horse Show Arena at Victoria Park. This piece was commissioned to recognize the 125th anniversary of North West Mounted Police “Ride West”, as well as the 85th anniversary of the Mounted Ride’s first appearance in Calgary. Don’t you just like stumbling upon hidden gems/treasures or unexpected something to do that interests you? What have you stumbled upon unexpectedly, recently. Oh, how I love art! Don’t you?